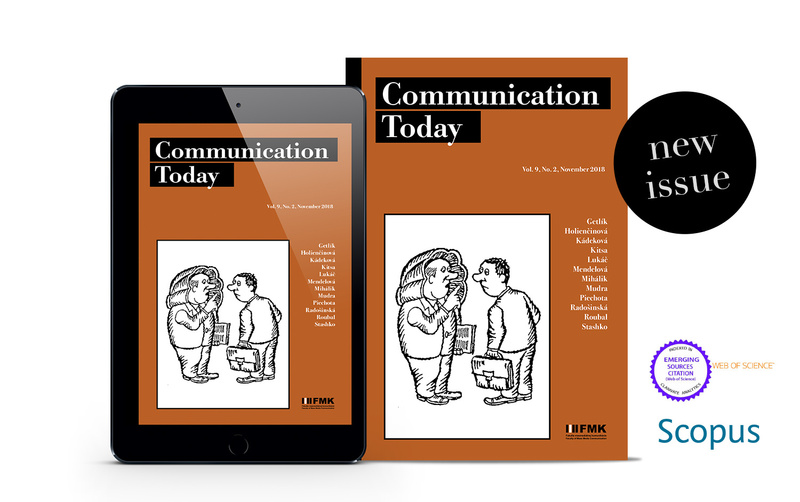 Communication Today is a scientific journal from the mass media and marketing communication field. The journal contains professional scientific reflections on the media, media competencies; it also offers academic discourses on the limits of reality, media thinking, new media, marketing and media relations, new trends in marketing including their types and specifics, psychology and sociology of marketing communication, as well as new knowledge about the structure of media contents, marketing strategies and communication sciences. The professional public is offered an interdisciplinary, focused, targeted discussion in these pages. Communication Today is a double-blind peer reviewed journal published twice a year. It focuses on theoretical studies, theoretical and empirical studies, research results and their implementation into practice, as well as professional publication reviews. The members of the journal’s editorial board are members of the European Communication Research and Education Association (ECREA). Communication Today is indexed in these databases: Cabell’s Directories, CEJSH, EBSCO, CEEOL, ProQuest, Ulrich’s Periodicals Directory, Index Copernicus, ERIH PLUS, SCOPUS and (ESCI) – Web of Science Core Collection.